“When the Son of Man comes, will He find faith on earth?” While we do not know when Christ will come we can answer whether or not He will find faith in our hearts when He calls us home. But to do so we must be honest…to truly follow Christ, have faith in Him, His Word, it is a battle. This is perhaps most powerfully realized in prayer. And it is why God seeks for those who will be His Prayer Warriors. In our reading from Exodus we hear of the people of Israel in battle with the Amalekites. Moses, leading the Hebrews led them victoriously, while his arms were raised. Yet in his human frailty, with the long battle…his arms, his prayers weakened. Unless helped, held up, by the fellow servants of God, the prayers of Moses would falter. In the gospel Jesus shares the story of the stubborn widow, teaching us to persist in prayer and not to give in the doubt, fear or weariness. Heed God’s Word, His call to prayer. This means being sensitive to the Holy Spirit to “pray without ceasing” in the middle of our daily tasks, in the cloister of our heart. Praying in response to the nudge of His angels, to pray, trusting God to answer. Praying for our family, church, a nation at war, or the unborn baby…fighting the battle of faith in prayer. Being a Prayer Warrior means we must be willing to support and be supported in prayer with God’s servants. 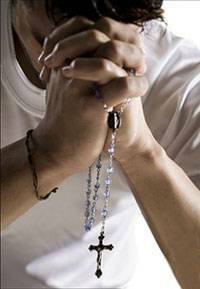 Perhaps it may be a fellow believer sharing a rosary. Or the real but unseen help of His angels awakening us to pray for a special need, God supports those prayers and those in prayer for His Kingdom. Especially, to be a Prayer Warrior we must be willing to Persist in Prayer. Like Moses in the battle, like the stubborn widow, all true prayer Warriors will persist in a faith rooted in love to the point of knowing God has heard and has answered. We will persist when weary, we will be strong in faith, when weak in body, we will be stubborn in faith when assaulted by doubts. We will be prayer warriors. Today God’s call for Prayer Warriors is more pressing than ever. This Respect Life month our prayers are needed in the battle for life on many fronts. Your prayers are needed for vocations, for young men to hear and respond to the call to the priesthood and for men and women of all ages to the Religious life. Those orders, especially focused on real prayer and service for Christ are seeing a resurgence in vocations. Prayer Warriors are needed with the parents, and adults, students of all ages who are willing to let their faith grow strong and stubborn in prayer for Christ. When the Son of Man comes..will He find faith, find prayer in us?